Each side of the trail was sliced by large claw prints, while the trail itself had been smoothed down, made slick we assumed, by the dragging of carcasses. My friend Don, and I were in Florida Panther country. A pile of deer bones off to the right cemented the idea that we had entered as he said, "a panther's dining room." 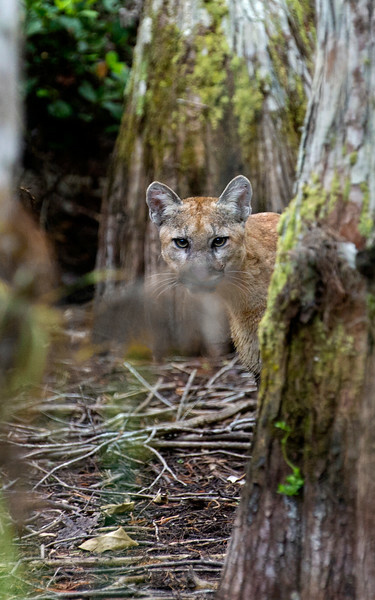 We moved on and the cavernous forest swallowed us, and soon our resolve to track big cats. Besides, there were no animal sounds or sightings so we drifted away from the trail and each other. I found air plants and lichen smattered bark to photograph. Long exposures and ruby red flowers complimented lush green plants. I was glad I brought the tripod. No breeze, I thought. Smells like an oxygen factory, pure, sweet, the stuff of city dweller's dreams. Don McDonald, is that spelled with a mac or just an mc? Wonder where he is? Deeper in, I guess. Wonder how many types of animals live in here? Cypress. Summer rains. Soon be under water. Look around, boy. Keep an eye. I looked from the viewfinder, turned my head, stopped breathing. The big cat sprang, but away from me, a blur of red brown fur and the longest tail I'd ever seen followed it. I hadn't heard anything but my camera shutter, hadn't imagined an animal so big could get within ten feet without my knowledge. My breath returned as the blur receded into a grey, vertical world of trees. I loosened the grip on the camera. But something wasn't right. What was it? Don. He'd gone in that same direction. I called, called again and then at a cracking sound like breaking branches, strained to see through the trees to my rear. Don yelled from between them. He hadn't gone east in the direction of the panther. He told me he'd also turned around and saw the panther in the crouch position. We had each been stalked. Then a brown and white face appeared. We raised our cameras as the silent, sleek animal peeked from behind a cypress trunk. But our cameras were still set for static, up close images. Who expected it to return?